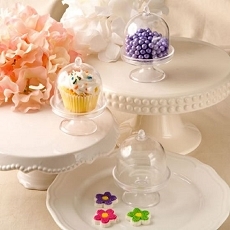 Cup cakes are all the rage and presenting them with a personalized message in a delightful mini cake stand will thrill your guests! Add a fabulous touch to your event tables when you offer your guests a cup cake with a personal message in a cute little stand. Our stands are made from clear acrylic plastic and feature a raised round base on a stand and a domed top that lifts off. Create your own personalized labels using our unique label designer tool and select your choice of color combinations, themes and border styles to compliment your event theme. Add a personal touch to your tables when you adorn them with these dramatic little favors! Labels come in sets of 35 on a sheet sized 8 .5" x 11"
A dramatic favor and a great way to showcase your designer cup cakes!